The above screen shot has been making the rounds today, and I've no idea if it's true or not. The story that goes with this image is that it was an email that was sent to Oman Air staff advising them that they, and residents of Oman, can't bring in alcohol when flying into the country anymore after August 1st. For liquor license holders, the license permits you to purchase alcohol from the licensed shops and to take them straight home for consumption at your home. Technically that means you take it straight home, not to a friends house if you are attending a party, or giving a gift to someone to mark a special occasion. Various hotels have licenses to sell alcohol on their premises via room service, bars and restaurants, and so getting back to my original point... what is the point of having alcohol sales at the point of entry? Tourists don't have the license, and thus cannot carry the alcohol, legally, to their hotel. So, I suspect we'll see either nothing happen (because this is a hoax), or if true, we'll see the booze on arrival shelves in the duty free cleared away. If it is true, this is another step towards tightening alcohol availability in the Sultanate, and quite frankly it's a logical step to make if you are trying to reduce the availability of alcohol here. However, as a long term resident though, this is disappointing because my wife and I typically return with something we can't get here, like wines from Canada, or a particularly good bottle of bubbly or something like that. For a birthday, or a special occasion (like our wedding anniversary), it's been nice to share something from home, and if the above is true, it's just another tightening of the screws for life as an expat in Oman. All I can think of is that every step towards a Booze ban increases my salary (as Oman becomes a "hardship" posting) and I can go back to my student days of home brew . . . . . .
Before commenting further, would ask who the message is supposed to be from, and who it is to. If it's to Oman Air staff, presumably it's from Oman Air's management (who else would want to communicate this to Oman Air staff?). If so, what do they mean by the term "guests"? Oman Air has "passengers", not "guests". But before dismissing this is as a hoax, let me add that many countries distinguish between what tourists and residents can bring in to the country, and very often deny "duty free" privileges to very frequent travellers such as airline crew - who often make day trips away from Oman, or even more than one trip abroad and back in a single day. Not giving such there-and-back again people the right to bring in 2 litres of duty free alcohol each and every time would surely be understandable. So maybe there's something in it. And it may not, really, affect residents who aren't also airline crew going to Dubai and back many times a day. When was the last time the monitors at the X-Ray machines (who are the one controlling who brings what into the country) asked you what visa you were on, a visitor's or a resident's? Even if someone did want to prevent residents from bringing in alcohol, how would they enforce the ban? It's clearly ridiculous. Anyone with any updates from their local embassy or just a quick check to the Oman Airport latest visitor rules can see it it laughable and stupid to even speculate on. Grow a brain and stop spreading all these hysterical rumours. 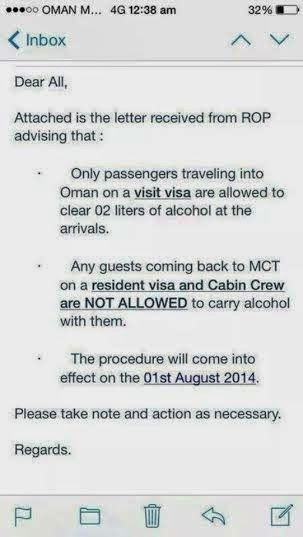 Booze is in Oman to stay. Whether it's implemented, and how it's implemented are the questions of course. Just done a trip to Dubai, alcohol available at Arrivals in Muscat, expats can carry in a couple of bottles each, and nobody said a word. So bring it in, looks like it is allowed! !